Chokolade kan man aldrig få nok af, det ses helt tydeligt her. Stemplet er - som mange af jer nok ved- en af mine kære små House-Mouse. Papirene er "Fika" fra Maja Design. Brads og knap fra Basic Grey. Blomsten lavet med retro punchen. punchet fra begge sider, bare lidt forskudt. Der er stickles på muffinsformen. denne gang er at inkludere en opskrift på kortet. på PC og printet ud. Jeg har brugt sketchen fra Sweet Sketch Wednesday. Skønt kort i de dejligste farver - og papir. Det passer jo fint til temaet. Such a beautifully colored image. I love the colors you have used. One of my favorite color combos. thanks for joining us. I love the cupcake paper and the pink/brown combo! Just adorable! Thanks so much for joining us this week at Sweet Sketch Wednesday. YUM!! What a sweet card! Love your image, so totally adorable! Thanks for joining us at SSW. Dorte, beautiful coloring on this super cute stamp. The colors and papers you used are perfect. 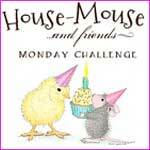 Thanks for joining us with this great take on the challenge at House Mouse and Friends Monday. Oh how cute this card is Dorte! Such a sweet image and I love those papers you've used. A wonderful card indeed! Thanks for sharing this with us at Sweet Sketch Wednesday! 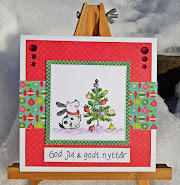 Hi Dorte, I do love your card, what a cute image it really makes me smile. Love your colours and embellishments together and great colouring too. 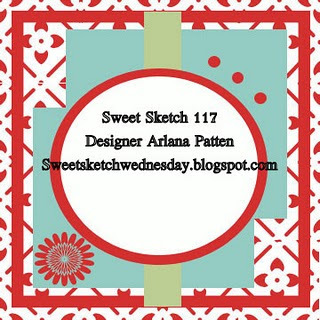 Great job and thanks so much for sharing your card with us at Sweet Sketch Wednesday and good luck. Hi Dorte, love your card. Can you please put it in the Mr. Linky now, it is finally up. Thanks for sharng your wonderful card with us at the Fuzzy Wuzzy Challenge this month. Hi Dorte love this recipe such a sweet image great colouring fab take on the Recipe theme chall. Thanks for joining us at Hanna and Friends this week. Awww...this is so cute Dorte!